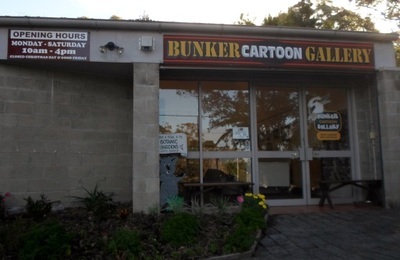 A visit to the Bunker Cartoon Gallery in Coffs Harbour is an experience that you won't find anywhere else. 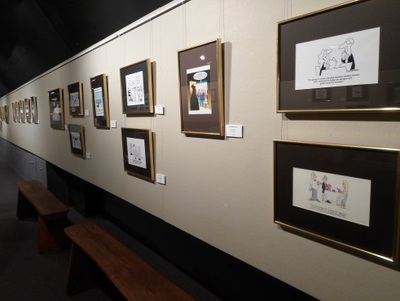 It's the only gallery dedicated to black and white cartoons in Australia (or indeed in the entire Southern Hemisphere). 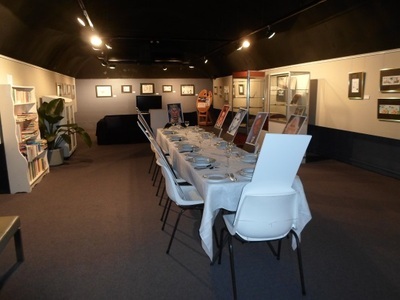 It also happens to be housed in an RAAF underground WWII bunker. The history of the bunker and its transformation into a gallery can be gleaned from a video screened in the gallery's foyer. If it's not already running, I recommend asking one of the very helpful staff on hand to put it on as it doesn't go for too long (around four minutes) and adds so much to your experience. Base Operations used the bunker to communicate with its aircraft, control area and headquarters as it sought to protect shipping convoys along the coast. Two other bunkers were also located in the area, and according to anecdotal evidence all three were once linked by underground tunnels (but these haven't yet been found). The gallery itself consists of a single, long room with pale walls and a curved black roof. New exhibitions take place here every month or so, featuring touring shows, community presentations and others drawn from the gallery's own archives. During my visit, the focus was on the latter and the theme was 'Dinner Party'. The exhibition incorporates much more than a series of pictures hanging on the walls. What first drew my eye was a table laid out as if for a special occasion, where caricatures of various celebrities occupyied each seat. I had fun trying to identify each of the guests; Oprah, Prince Charles, Jack Nicholson, Geoffrey Rush and Judy Dench where all in attendance. When I started browsing the cartoons themselves, I definitely developed an appreciation for the form. 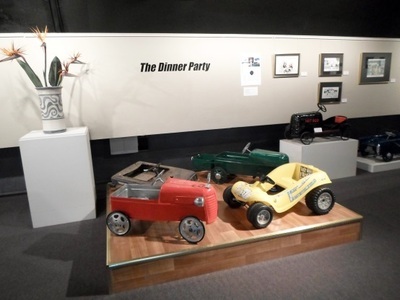 Initially, I had been drawn to the gallery because it sounded so unique, not because I had any passion for cartoons, but I was quickly awed by their wit and humour as they played on common phrases and situations. Most of the works on display were by Australian cartoonists and had been produced in the last few decades. One frequently recurring name was that of Mark Lynch, whose work I recognised from the papers. Tony Lopes was another whose work seemed familiar. The cartoons were not just found on the walls though. 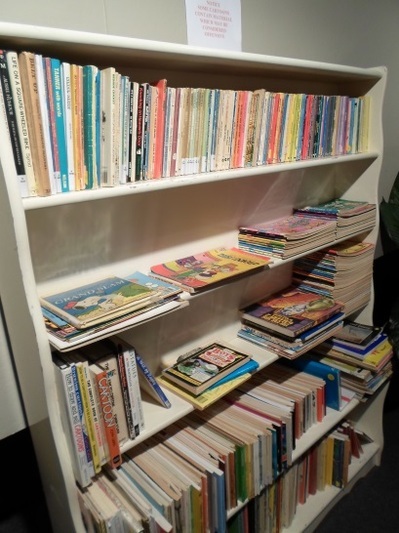 There were also stacks of comics on shelves, with comfy lounges arranged nearby, and down the other end of the room, a table was covered with folders containing more works from the Coffs Cartoon Collection, which is the largest contemporary collection of original cartoons in the country. My companion and I hadn't planned to stop at the gallery (at least on this particular day) and only visited because we had some spare time after our trip to Dolphin Marine Magic. We had arrived an hour before closing, but it turned out to be ample time; half an hour to explore the gallery (including reading each cartoon) another half to sit and look at the folders until it was time to leave.